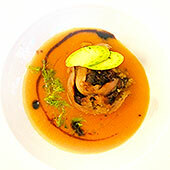 A Sophisticated Italian Country Cuisine of Liguria, the Italian Riviera. Although it is the restaurant of Hotel La Meridiana, restaurant "Il Rosmarino" can stand on its own as a fine establishment offering superb cuisine of the region, Liguria, on the Italian Riviera. Although northern Italian, the traditional food of this area has been based on olive oil, lots of fresh vegetables and sea food of all types. There is no butter or cream or expensive and rare ingredients. It is simple country food, bursting with taste. Restaurant Il Rosmarino's fine chef, Mirko Caldino, has applied modern cooking techniques to this traditional food and produced a menu to make us weep. Although based on the country cooking, no one's grandmother would or could have produced this cuisine. 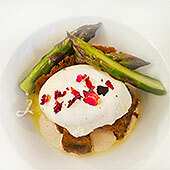 Caldino has brought enormous refinement to the cooking without ever loosing touch with the essence of the local food. This restaurant certainly deserves a Michelin star. The Michelin reviewers must be asleep at the wheel or too busy taking stars from deserving chefs in France. Personally, I tend to think the Michelin crew thinks in terms only of Haute products such as foie gras, truffles etc. 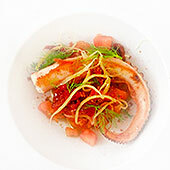 rather than sophisticated tastes that a truly fine chef can elicit from even the lowliest of vegetables and herbs. Here you will find marvelous dishes straight from the family table and others using the same ingredients and tastes as used in family kitchens butelevated to a much more refined level. Rich vegetable and seafood soups, local pasta called "tropie" and "corsetti" (short strands just 1" long) basted with a heavenly rendition of pesto that will make pasta lovers toes curl will be followed by or preceded by a marvelous layered eggplant with tomato sauce or a pasta of flat noodles with jumbo shrimp and tomatoes. The wonderful fresh fish and seafood from Albenga just down the road at the coast give zest to the menu. Their menu changes with the seasons. January through April, the artichokes, the violet asparagus, the first big, long zucchinis of the region (long and thin, over a foot and slightly curved with a light green skin) and the peaches arrive as do the large, meaty beef steak tomatoes. Summer is a veritable harvest of all things marvelous and the fall sees game with boar, rabbit, porchinni mushrooms and herb omelets. The sea, of course, is always there, although Albenga does not have a fishing harbor, nearby Allisso does. The dining room is broken up into several sections, some large and other small and intimate. In fine weather they serve outside and many dishes are cooked on the large external barbecue.